It's not just Alex Thompson Racing hitting the bay of biscay in January! Firebird have just completed the first part of their trip from Palma to Hamble, UK, with the final destination of Norway. The boat will be heading into the arctic circle, 69 degrees north, to Tromso to explore the fresh powder of the Lyngen Alps. The 90ft boat will be exploring the fjord water ways with an experienced mountain guide, summiting the fjords with guests daily for gleaming untracked powder. The luxury ski and sail charter guests will ski directly to the boat, welcomed by the crew and comfortable interior, for warming evening of fine food whilst moving to the next location. For charter enquiries please contact your preferred broker. The whole crew arrived in Palma refreshed and ready for round 2. The forecast for the week was light, but the bay of Palma rarely doesn't produce something of a sea breeze. The courses set by Real Club Nautico Palma were less taxing on the navigator and tactician, with less islands to avoid and negotiate, and Race 1 we came out of the blocks cleanly, sailing well, hoisting and dropping our spinnaker neatly. Racing in 10-12 knots of breeze in warm sunshine always feels good, but knowing you've done your best on the water makes it all the better. Crossing the line we felt we had done OK. We feelings were justified with the boats first 2nd place finish. Race 2 felt slightly more processional with less tactics at play and long reaching legs, not allowing us to show our quality in the corners that we have practised so much. The wickedly fast Southern Wind 'Koboko Dos' managed to get there nose ahead early on and pulled out a substantial lead once sailing in clean air. The battle for 2nd was much closer with us and Tempus Fugit on the water, we managed to pull ahead despite Tempus Fugit making use of her Code Zero on the reaching legs. In the end only 20 seconds on corrected time separated us, but we had to settle for a respectable 3rd. The final race promised slightly more wind, and at moments delivered. An upwind followed by another tight reach left us with a close spinnaker reach gybing on to a downwind to the finish. Fate was not quite on our side as on the reach the wind kept sneaking left meaning the angle would be too hot for the kite on the next leg. Another reach then. Tempus Fugit went for the Code Zero once again in an attempt to catch us, we had to make our last hoist of the regatta a good one. Rounding the mark, all went more or less to plan, but Tempus were hot on our heels. We came through the line powered up on our A2 to take another 2nd place on corrected time. In the overall standings we took 2nd in Class, which was awarded to us by Britta Bunkenburg of Royal Huisman. A fantastic second event for the team, and a job well done. What an entrance in to the world of regatta sailing! 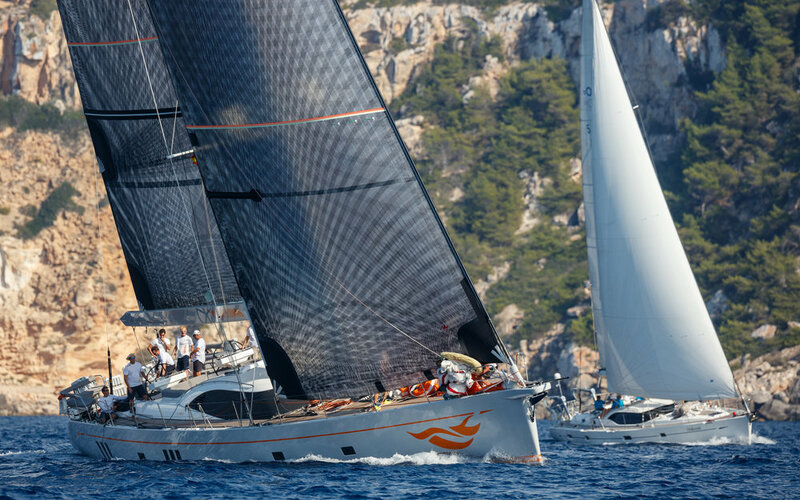 The Loro Piana Superyacht Regatta, hosted by the Yacht Club Costa Smerelda is by far one of the most prestigious events in the superyacht calendar, and we could not be more excited to be here. Although we felt prepared after several training sessions, nothing quite conditions you for the tension in a real race scenario, and adding the our first day nerves, race one saw a stiff 25 knot breeze building up the race track from the Northwest. The course led us all the way around Isola Spargi, through arguably some of the most stunning sailing grounds in the Med in a 31 nautical mile course. A tough first day out racing, but with lots learnt in manoeuvres and boat setup. For Race 2 we were sent up the Monaco Lighthouse, which served as a turning mark, and allowed us to match up to lighter and faster boats, with lessons learnt from day 1, our pace was good and we held our own nicely. Seeing a range of wind strengths, up to 22 knots made trimming and boat setup a full time job for the back of the boat. Coming in across the line in a dying breeze, meant we were able to stay ahead on corrected of the two lower rated boats in the fleet. With lighter conditions forecast for race 3, there was no doubt it was going to be a more tactical day on the water. With softer winds than the two previous days, we were able to carry our A3 higher than our rivals on Oyster 825 Maegen, putting us comfortably ahead at the second mark. As the day wore on and the winds got lighter and shiftier, some of that margin was reclaimed as we struggled to make the most of our A2 in sub 10 knot winds in a VMG run down to our last turning mark. A very smart last minute gybe drop of the kite put us in good stead though, rounding to head to the finish. The dying breeze made it a painful last leg, but a great day on the water and beautifully sailed by the whole crew. On the last morning, very little wind stirred the flags in the harbour, and so an AP was in place for most of the morning. Breeze filled in from the south however, and we sent to chase the wind, with a course around the Mortorio and Soffi Islands. After a short beat to a laid windward mark a long fetch which turned into a beat as the wind consistently clocked right put us in exciting close quarter manoeuvres with two boats at the first island, pressure was on with the camera helicopter ominously hovering overhead. A fast reach was soon to turn into an even faster downwind, but we struggled to set our A5 and lost some ground. We were then upwind to another inflatable mark, clawing back ground on the faster boats in the fleet. The last leg was an extremely short downwind to the finish, and exhausting, but satisfying way to end our racing in Porto Cervo. Tired and happy faces all round, after what has been a tough first regatta, but the building blocks are there, and everyone knows the potential of the boat and the crew now. 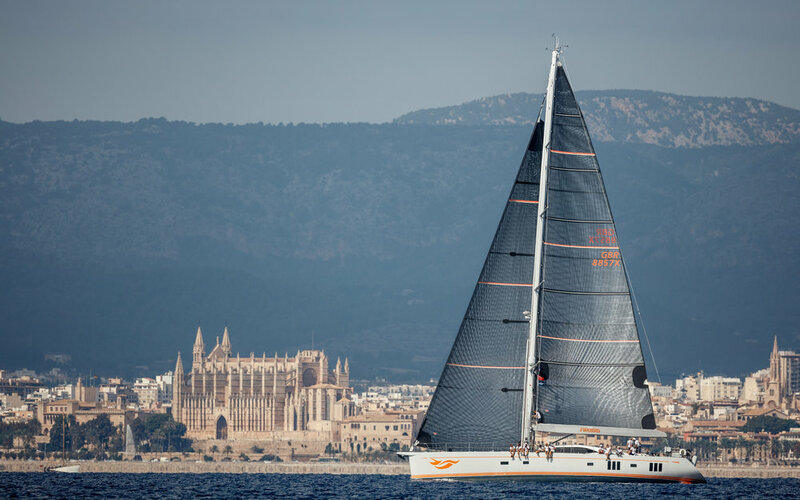 The Superyacht Cup in Palma now beckons, Firebird is coming.